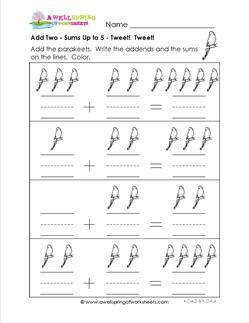 These kindergarten addition worksheets are the perfect complement to your beginning addition lessons. Your kids will love them because of the fun themes and pictures. You’ll love them because they follow a progression for learning by starting with smaller sums and working up to sums of 10. Primary writing lines on most pages help guide kids in writing their numbers neatly. The addition flashcards have sums up to 10. 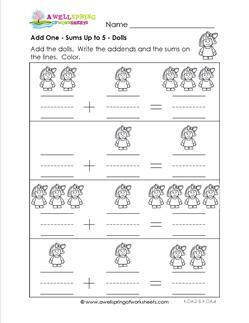 Go to this page to choose from all the addition worksheets on this site. 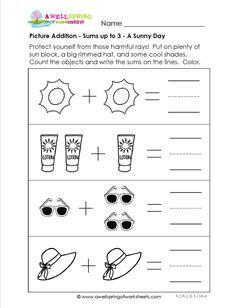 Our picture addition worksheets are perfect for children who are just learning to add. 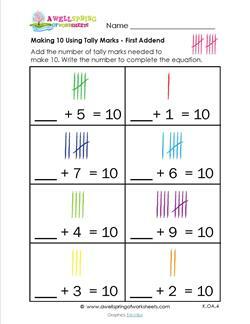 Starting with sums up to 3 and increasing to sums to 10, these worksheets provide a progression for learning. Children add by counting the objects and writing only the sums. Primary writing lines are provided to encourage careful and neat writing. 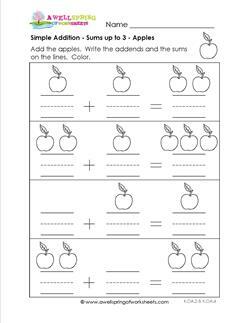 These kinds of worksheets introduce children to the concept of putting together as well as getting them familiar with the addition sign and equal sign. 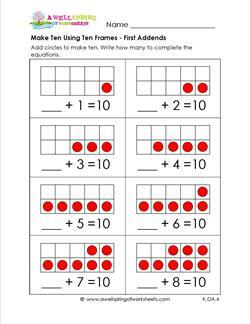 This set of make ten using ten frames worksheets offers another way kids can practice putting numbers together to make the all important ten. Kids draw the number of circles that are missing to fill in the ten frame and use this number to fill in the missing addend. The first three worksheets switch from the first addend missing to the second addend missing and then a variety of both addends missing. The second set of three worksheets puts the same number in the first and second addend. 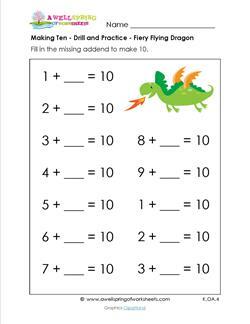 Fairy tales come alive in this medieval themed set of making ten addition worksheets. These simple drill and practice pages have the addend in the first position, second position, or both and follow a simple story line of being introduced to the characters, the battle for the princess, and the happily ever after. Created with differentiated learners in mind, as well as the need to practice, practice, practice, these worksheets have 12, 15, 24 or 30 problems per page. In these addition problems children graduate to using numbers to add instead of pictures. 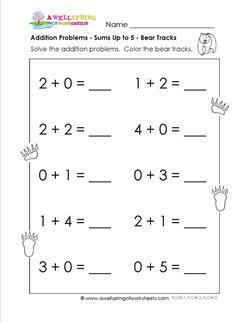 This set of worksheets starts with sums up to 5 and progresses to sums of 10. They have ten to twenty problems per page. Five of the worksheets have a line for a score of up to 20 problems so they would be great to use for assessments. Look for the pages with bear tracks, apples, dollar bills, dominoes, or just plain old numbers. Addition flash cards come in handy when learning basic addition facts. These printable flash cards come in color and black & white for numbers 0 -10. Look for the complete sets with all the numbers 0 -10. All sets have up to sums of 10. For longer lasting cards, print on card stock. Cut along the dotted lines. You’ll need to write the correct answers on the back.